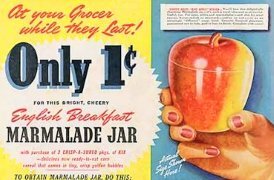 I’m always interested in the history behind an item, and over the past couple of years I’ve been collecting information about Hazel Atlas jam jars. 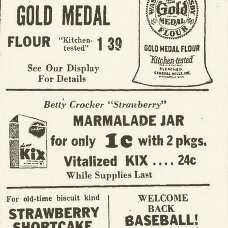 I have been able to find radio commercials, newspaper and magazine advertisements that describe the Kix cereal promotions in detail and definitively date the apple and strawberry to 1940 and 1941, respectively. I still have not found any advertising for the pineapple. 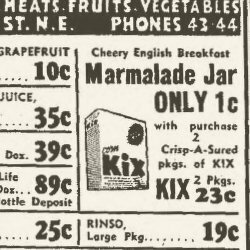 I have noticed that in all of the 1940 ads the jars are described as “cheery English breakfast marmalade jar.” By 1941, the wording had changed to “Betty Crocker strawberry marmalade jar.” The details of the promotion remain the same… one jar for one cent with the purchase of two boxes of Kix cereal. 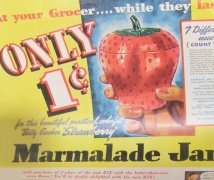 The magazine advertisements featured an actual-sized drawing of the apple or strawberry… the apples were featured in 1940 advertisements and the strawberries in 1941. 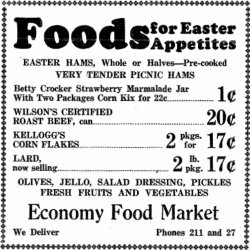 Is it possible that a pineapple promotion was planned for 1942 and never happened because of the start of World War II? Could that be why so little information has been found about the pineapples and why so few of them exist today? Makes a big hit at parties! Thank you for gathering and sharing all this information about these jars. I loved being able to see and read the actual ads. I’ve always wanted more information about these jam jars. I have one apple and love it. I hope to add the other two someday. That radio ad is wonderful! Don’t you just love the phrasing and the way the radio guy presented this ad? I’m old enough to remember when radio was like this, not quite as antique as the Hazel Atlas jam jars, but getting there. 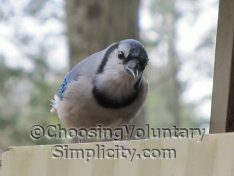 Thank you for all your hard work on this wonderful site. I’ve been reading here almost since you began but this is my first comment. This information is just what I’ve been looking for but haven’t been able to find. I’ve seen sellers describing these jars as even being from the 1960s, right in there with the ones exactly like them being described as from the 1930s. I appreciate seeing the actual ads and this opportunity to accurately date the two jars I have. A great post as usual. I’m fascinated by these colorful jars and the other items this company made. When we went through my mother’s things we discovered she had so many dishes made by this company. Your information has been a much appreciated find.